Lady Beetle Lady Blog | Learn more about the prettiest, fiercest insects around! Learn more about the prettiest, fiercest insects around! This is one of the prettiest lady beetles in North America, and is often found on flowers, making it one of the most photogenic, too! Its more-common common name is the Spotted Lady Beetle, which I find singularly annoying: it’s not as if the unique thing about this lady beetle is that it has spots! 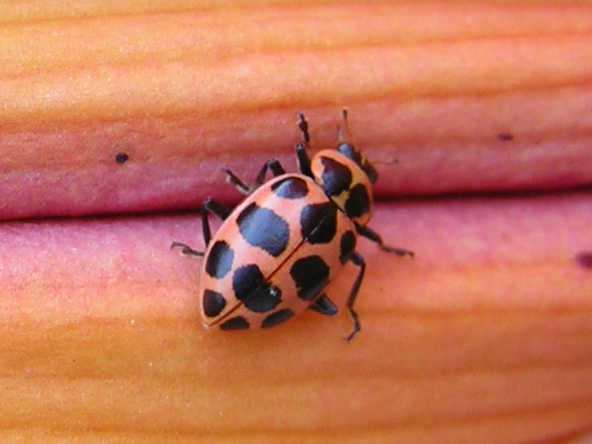 Another common name that fits better is the Pink Spotted Lady Beetle – the lovely pink color really is unique. However, the southern subspecies Coleomegilla maculata fuscilabris is often orange or red. So….I just call them C-Mac! Another unique thing about this species is that it can survive entirely on plant pollen, and even when aphids and other insect prey is available, C-Mac will sometimes snack on pollen. This may be one reason it is still quite common after the introduction of non-native species like the Seven-spotted Lady Beetle and the Multicolored Asian Lady Beetle. While many native species are out-competed for insect prey by the voracious newcomers, C-Mac can thrive on pollen right alongside them. I thought about titling this post “What is a lady beetle?” but that seemed a bit insensitive to my readers’ intellects 🙂 But what I meant by that was, how do you tell lady beetles from any other insect, and what other terms describe them? “Lady beetle” is a more precise term for the insect commonly called a ladybug or ladybird. Red lady beetles with black spots are among the most easily-recognized insects. There are many other colors and patterns, though, which can be hard to identify. The following physical features will identify all lady beetles, no matter what color they are. Pronotum (hard shell in front of wings) often conceals the head from above, and may even look like a head. Photos show the same species with and without head concealed. Antennae short or very short with 8-11 segments; last 3-6 segments form a weak club. Click the thumbnails for a close look at the details. Tarsal formula 4-4-4, but appears to be 3-3-3. In other words, each lower leg appears to have three segments. Chilocorus kuwanae has no common name in English, and has been introduced to North America for biocontrol. 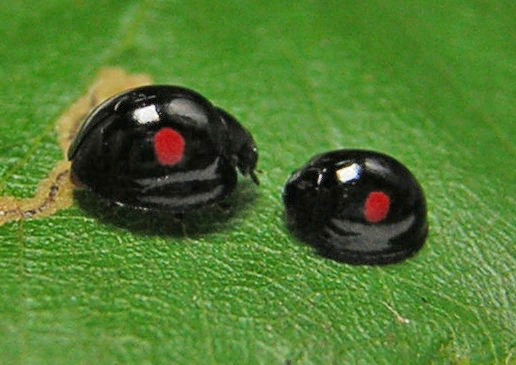 It is a beautiful species, glossy black with two red spots. There are a lot of lady beetle species with this pattern, and they’re not even all in the same subfamily! C. kuwanae is one of the easier ones to identify because of the shape and location of its red spots. They are squared-off, rectangular rather than round or oval, and positioned at or behind the midpoint of the body. If you flip one over, you’ll see that its underside is half black and half red (black head and thorax, red abdomen). This distinguishes it from the most similar species, Chilocorus tumidus, whose underside is red on both thorax and abdomen. Other species of Chilocorus have round or oval spots positioned towards the front of the body. The river birch trees where I find them here in Philadelphia are the “weeping” type of birch, with long whippy branches that dangle down, forming a canopy with an open space beneath. The lady beetles aren’t visible from outside because they and the scales are on the undersides of the leaves. The first time I pushed aside the branches and walked under one of the trees, I was astounded to see literally hundreds of lady beetles! I couldn’t look three inches from one without seeing another. The photos show the spiky larvae, pupae, freshly-emerged adults “coloring up,” and finally two adults mating. Hopefully I can find and photograph eggs this year and BugGuide.net will show all four life stages of this species! Despite the name, not all of these beetles are gray; some are black with two red spots. They are also not the only gray lady beetles around – be careful of mistaking them for the 15-spotted Lady Beetle (Anatis labiculata). That species has spots evenly distributed on its body, while the Ashy-gray Lady Beetle has more on the front end of the body than the rear. Also, some of its spots are heart-shaped – very charming! Ashy-gray Lady Beetles are primarily arboreal – they like to live in trees. That’s the only place I’ve ever found them, likewise for the entomologists I personally know. That doesn’t mean they are exclusively arboreal, but certainly if you are looking for them, you should look up! They eat tree aphids and possibly the occasional scale insect. Like almost all lady beetles they are a good thing for your yard and garden! Check out my new Facebook gift app! Soon to be a “bug blog” about my favorite insects, lady beetles! (Also known as ladybugs and ladybirds.) I’m a passionate amateur in the study of these beautiful, fascinating insects. I just love the ladies, and I hope my blog will encourage others to love them too! I had a big “whoops!” moment today when I accidentally uninstalled one of my other blogs, where I’d just posted a 4-minute video of a monarch butterfly caterpillar pupating. I needed somewhere to put it and hustled it over to this blog, even though it isn’t a lady beetle. Watch the video Monarch Caterpillar Pupating.